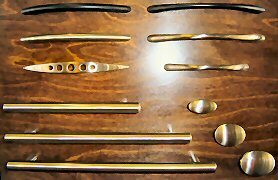 We take pride in having the largest selection of cabinet pulls, and knobs in Texas. 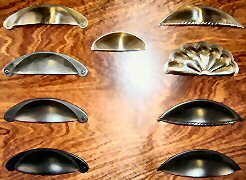 These are examples of the wide variety of styles of knobs and pulls that we have available. Please contact us if you need assistance. Visit our booth often to see new additions. phone: 214 808 8084 (cell). Print the map for assistance. Visit Jim's Discount Cabinet Hardware for quality hardware at discount prices! 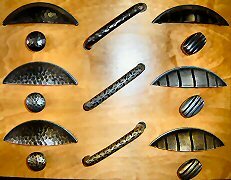 We have a large selection of cabinet pulls, knobs, and hinges in many different finishes. The hardware you see here sells for $1.25 to $6.25 each. What a deal!